“It isn’t so much a matter of feet but of inches”.. wise words from a client on a local stream, trying to land a fly across a current seam, between two boulders and under a tree so as to get a six inch drift, drag free and close enough to a feeding fish to illicit a take. All too often we consider fly casting in terms of distance, and that is no bad thing, but there is another part to casting effectively , what perhaps golfers would refer to as your “short game”. Most stream fishing requires casts of only moderate distance but frequently demands unprecedented accuracy combined with delicacy. To achieve that there are a few things that anglers need to understand, much of which goes against the normally accepted wisdom of fly fishing. Firstly you need to use a longer leader, quite possibly a LOT longer and if a long leader and accuracy seem an oxymoronic combination to you I would suggest that you read on. 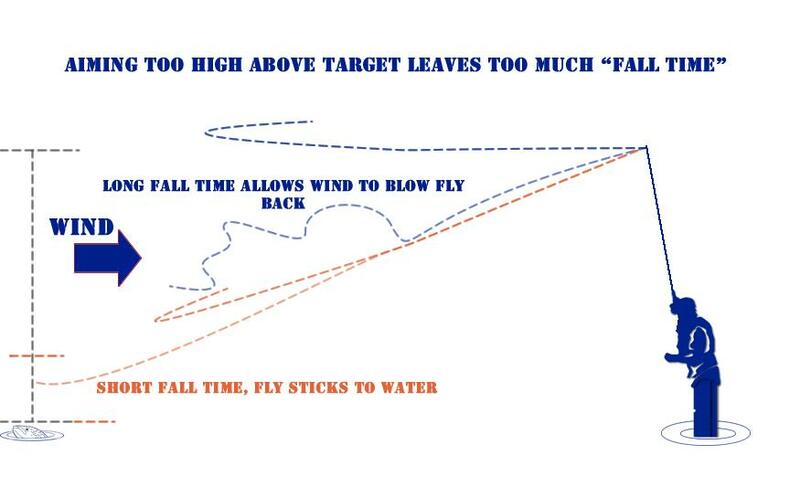 It should be obvious to anyone with much experience that accuracy requires line speed, a fly line flipped out in a wide loop is at the mercy of the wind, won’t get in under trees or penetrate a downstream gale and results in the fly floating down well after the fly line has landed. So the goal is to have tight rapidly propagating loops produced by a straight rod tip path, (remember that the shape of the loop, in particular the top leg of the loop is entirely determined by the rod tip path), and a rapid rotation to produce rod tip speed. For the most part that goes for all casting but for a few specific exceptions. Once you are able to cast nice fast, tight loops the next “problem” is that fast tight loops are liable to have the fly crash into the surface perhaps sinking the fly and scaring the fish. This is where the long leader comes into play. 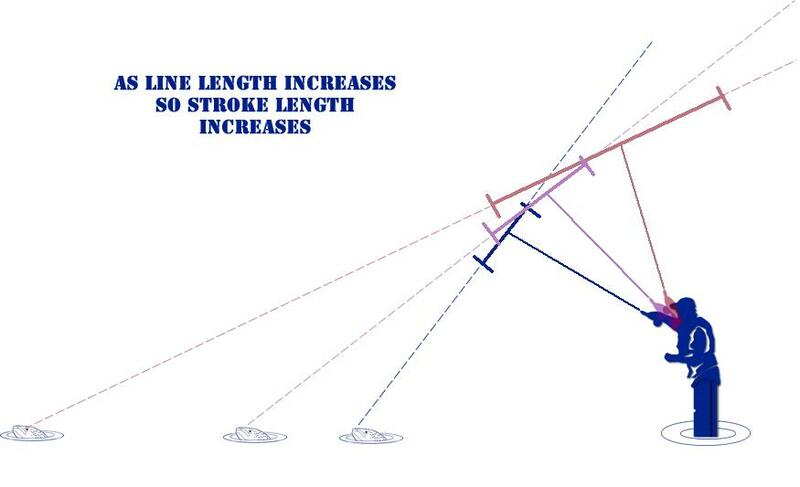 Ever wondered why a fly line is tapered? Getting thinner and thinner towards the front end. It is to burn off energy, bleed away all that casting energy that you created such that the fly will land gently, but the taper in the line is not sufficient on its own to slow things down enough. Try casting a fly line without a leader on it and see how much the tip of the line “kicks” over at the end of the cast. This is residual energy that hasn’t been burned off as the cast comes to an end. A long tapered leader then assists in burning off excess energy such that in an ideal world the fly runs out of steam just as the loop turns over. If I were to offer you five hundred bucks if you could cast a fly into a tea cup ten metres away and then say that you could choose a set up with a 9’ leader or a 15’ leader which would you choose? Most would pick the 9’ option believing it to offer better accuracy, but to be sure of hitting the cup you would have to generate a lot of line speed and with a 9’ leader the fly would almost certainly bounce out of the cup. The alternative option with the shorter leader , which is in fact what most anglers do when fishing, is to aim high and “hope” that the fly will miraculously float down into the cup. The traditional “land like thistledown” presentation. Useless in all but windless conditions and not the best way to approach things. The smart money would be on the longer leader where the energy of a fast accurate cast would burn off just as the fly arrived inches above the cup and it would fall in, winning you the money in the process. In essence, the better you cast, the tighter the loops and the more energy you impart into the line, not only CAN the leader be longer, in fact it MUST be longer. (as an aside, this is the reason that I detest furled leaders, furled leaders preserve casting energy, the antithesis of what I believe you want. Certainly if you are a poor caster they may make casting seem easier, but I assure you that you would be better off to practice your casting and ditch the furled terminal tackle). So you have now got the perfect loop sorted out, you are generating massive amounts of line speed and are using a long leader to burn off all that excess energy such that the fly lands softly after all. There is still one very important step that you have to take, you have to change the angles of your cast. Often in an attempt to “aim at the water” then the caster breaks the 180° rule. Making a near horizontal back cast and bringing the rod down along the ideal casting angle on the forward cast, resulting in a wide loop, the line hitting the water before the fly and no accuracy or line speed. The answer to getting more accurate is to aim at your target, not above it and to burn off the energy just as the fly arrives. 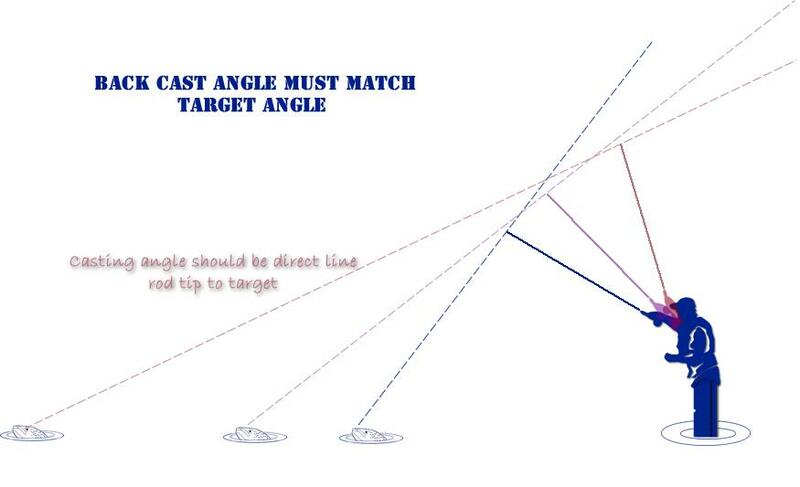 To aim at the target you have to change your casting angles. 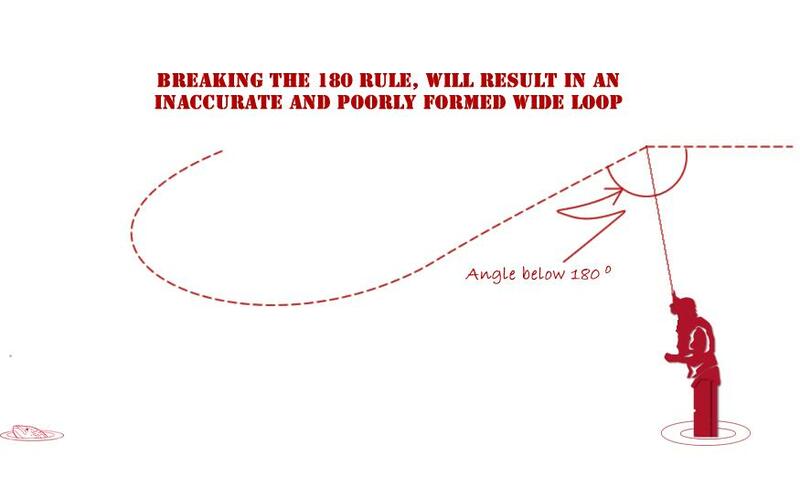 The 180° rule states that the line should follow a 180°path. If your back cast is low or sags down your forward cast will either be high or have a very poorly formed wide loop. Take a look at the diagram below to perhaps make this more clear. In essence then, it is your back cast which determines the forward casting angle, back cast along the ideal line between target and rod tip. For close targets this means a back-cast that, to most people, looks ludicrously high above your head. Adjust your back-cast angle in line with the target, higher for closer fish and more horizontal for far ones. Lengthen your leader to insure that all the energy is burned off at the completion of the cast. Maximize line speed, do not modify your cast or loop shape to try to achieve delicate presentation. Delicate presentation is the leader’s job NOT yours. Have the fly turn over only inches above the target. The best way to practice is to have some targets on the lawn, a bit of wool in replacement of the fly and play with the angles. To start with you will no doubt find that the closer targets are the hardest to hit. Adjust your angles and all of a sudden those close ones will be easy. One final note: as the targets (fish) get further away and the angles get shallower so also you will be casting longer lines and the rod will be bending more. So you will not only need to adjust the angles but also the stroke length of your cast or you are going to get tailing loops. Get out there and play on the lawn, it will improve your fishing. Tim Rolston is an IFFF (International Federation of Fly Fishers) Certified Casting Instructor and runs both Inkwazi Flyfishing Safaris , a guiding operation based in Cape Town South Africa and “The Casting Clinic” offering individual and group fly casting tuition to both beginners and experienced anglers. You can contact The Casting Clinic by email, just click on the logo below.